Working Church makes organizing them a snap. 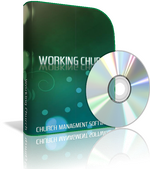 Other church software programs for member management may require you to live with their predefined groups and categories, for members, cell or small groups, etc. Once you've tried Working Church software for your group and member management needs, we think you will soon agree that our concept of group memberships, with the power and flexibility it puts in your hands, sets a new standard for member management software, and beats any other church attendance, church management software, or membership software products hands down, especially at our affordable price (click here to see).